So, you’ve got a brand new wordpress blog! This post will tell you what you need to do after you start your wordpress blog. If you already have a wordpress blog, you can still do these things if you haven’t done them yet . So, here is my checklist of the 17 important things to do after starting your wordpress blog! Enjoy! And if you don’t use wordpress, click here to read about why you should use wordpress). If you have noticed, some blogs, like http://mashable.com/, don’t use the ‘www’ in their address. And some blogs, like http://www.techcrunch.com/, use the ‘www’. So if you type http://www.mashable.com, it will redirect to http://mashable.com, and vice versa. One advantage of having a www is your blog address will look more formal. And if you don’t use the ‘www’, your address would be shorter. To decide, go to yourblog.com/wp-admin/options-general.php and change both the ‘WordPress address’ and ‘Blog address’ to http://www.yourblog.com, or vice versa. If you are wondering what a blog feed is, it is a slimmed-down version of a blog that is created to be easily syndicated. You can subscribe to it using email or an RSS reader. A feed is represented by the orange RSS icon. Many people prefer to get updates of your new blog posts through this easy way. You can set one up at feedburner (Here’s how mine looks like). It’s free and easy! Just type in your blog address and click Burn Feed . After that, set up email subscriptions, which enables your readers to subscribe by email. Go to Publicize >> Email Subscriptions in order to activate it and get the form. Not setting up email subscriptions is a big mistake when it comes to getting subscribers to your blog because most people don’t know about RSS readers. Also, about 50% of my blog subscribers subscribe by email, so email subscriptions is a must! After that, put the form and the RSS icon on your blog and link it to your feed at feedburner so people can subscribe. Feedburner Feedsmith is a plugin that detects all ways to access your original wordpress feed and redirects them to http://feeds2.feedburner.com/yourfeed. This plugin is needed for feedburner to track every possible subscriber to your blog by redirecting those who access http://www.yourblog.com/feed to feedburner. So, click here to install this plugin! It’s important to subscribe to your own feed, because it lets you see what your subscribers see, and when something is not right with your feed, you’ll notice. Besides, it boosts your subscriber count by 1 too . Hehe. You can either use an RSS reader or email to subscribe to your feed, but it is best if you subscribe to both of them. If you have a google account (which you most probably do – if you use Gmail, you have one), you can go to Google Reader. After logging in, click ‘Add a subscription’ and type in your blog address there. A favicon is the icon you see next to your browser address bar and in your browser bookmarks. Gloson Blog’s favicon is . It helps you brand your blog and also helps people locate your site more easily in their bookmarks. 1. Create a square image and upload it to http://www.html-kit.com/favicon/ to generate a favicon. 2. Download it and upload the .ico file it using an FTP client to /wp-content/themes/yourthemefilename. 3. Go to the wordpress administration area and then go to Appearance >> Editor. 4. Click on “header.php” to edit it. 6. Press Ctrl + F5 (Clear cache and reload) on your homepage. You should see it now! A permalink is the address of a blog post. This post’s permalink is http://www.glosonblog.com/17-important-things-to-do-after-starting-your-wordpress-blog/. By default, the permalink structure is like this: http://yourblog.com/?p=123. Instead of the post ID, I suggest changing it to http://yourblog.com/your-post-title in order to gain SEO benefits. Also, if a visitor looks at it, he will know what the post is about before clicking it. To do this, go to yourblog.com/wp-admin/options-permalink.php and then, type in “/%postname%/” in Custom Structure. 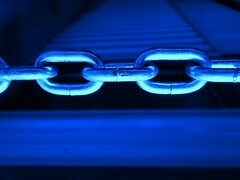 Don’t worry about broken links because the default structure will redirect itself to the new structure . For example, this post’s old permalink structure is http://www.glosonblog.com/?p=1833. Click it and see what happens . An ‘About Me’ page is essential for every blog. When your readers are interested in your content, they want to know who wrote it. That’s when they go to the ‘About Me’ page. Basically, it is just a page that tells who you are, what is your blog about, interesting things about you, and of course, a picture of yourself. A contact form is an professional and easy way for your readers to contact you. It also protects your email address from spammers. There are some wordpress plugins that allow you to put up a contact form. I recommend Contact Form 7, a very popular contact form plugin. 9. and don’t forget the archive page too! An archive page (here’s mine) is where people can find all the posts on your blog, from the first post to the latest post. An archive page is important because it lets people discover your older content easily (and generate more pageviews). To make an archive page, I recommend SRG Clean Archives, the one I’m using now. It’s clean and displays all your posts neatly. If you are looking for a more creative and fun archive plugin, you should try Snazzy Archives, and here’s how it looks like. or hire someone to design it or design one yourself . A theme (design) is really important to a blog because it represents the blog’s brand. Because if content is king, the design is the shiny robe and crown. So I recommend you to find a not-so-common theme that you like. Then tweak it and make it a little (or better, a lot) different than the original. One way is to change the structure of the theme by going to the Theme Editor (yourblog.com/wp-admin/theme-editor.php) in wordpress. Another easier way is to change the images of the theme. The images are located in the theme’s folder. After editing the images (like changing its color or texture), you can overwrite them to your blog using an FTP client like Filezilla. Be sure to press Ctrl + F5 to clear the cache to see the new design. A ping list is a list of services that will be pinged each time you post. 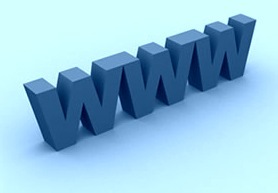 The services will notify sites and directories that you have posted a new post, thus giving you more exposure. To set up your pinglist, go to the Update Services section in yourblog.com/wp-admin/options-writing.php. And paste the sites you want to send a ping to. Note that the more pings you list, the more server resources your host has to use. So you might get suspended on a shared hosting if you use too much server resources. This is a short recommended list of pings. I recommend Google Analytics, because it’s quite advanced and has lots of features. It’s free and all you need is a Google Account. Google Analyticator, a wordpress plugin, allows you to easily add a Google Analytics tracking code. Note: And please don’t become a stataholic! Write more posts! WordPress Database Backup, a wordpress plugin, allows you to schedule blog backups (hourly, twice daily, daily, weekly) easily and have them automatically sent to you by email or stored in the server. 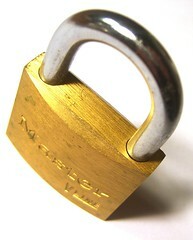 Backups are really important because if anything ever happens to your blog, you have the backup, your best defense. Most of the login usernames of wordpress blogs is ‘admin’. If your wordpress blog’s login username is ‘admin’, too, you should really change it to something that can’t be guessed easily because the default name makes hackers’ lives so much easier. 1. Go to the wordpress admin area. 3. Fill in the details with a different username and give it administrator privileges. 4. Log out and log in with the new username. 5. Delete the ‘admin’ user. 6. When you do so, it will ask you whether you want to move the posts and links of ‘admin’ to another user or delete them. Attribute the posts to the new username you have just created. Blog Title >> Blog Archive >> Post Title. Which looks simply much better and shorter. It also noindexes the date and category archives so that it won’t appear in search engine results pages and won’t receive duplicate content penalty. A 404 page is what your readers see when they go to a non-existing page on your blog. 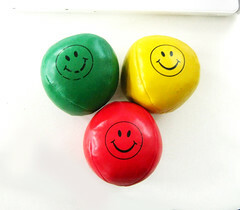 Like this: http://www.glosonblog.com/thispagedoesntexist. By default, the page is just a ‘404 error – Page not Found’ 404 page that isn’t much help to your readers. Why not make it more helpful instead? To do this, go to the wordpress admin area and then Appearance >> Editor. Click on 404.php to edit it. 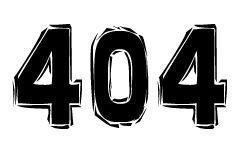 Find the part of the code where it says <h2>404 Page Not Found</h2> or something like that. Then overwrite that line with this code (My version of a 404 page). Be sure to make a backup of your old code before overwriting. It will probably work on most themes, but in some cases, it won’t, then you need to have a little bit of HTML knowledge in order to make it work. Feel free to edit and customize the code! Do tell me if this code doesn’t work! Still, without any content, a blog won’t be a blog. So go on and write a post! Write a unique high-quality thought provoking post on a topic you are passionate about! After that, promote it on twitter, facebook, stumbleupon, and so on and on. Ask your friends to read it too! So here are my 17 things to do after starting a wordpress blog checklist. Be sure to bookmark this post and read it when you start a new wordpress blog! If you know of another thing to do after starting a wordpress blog, please tell me in the comments! And if you have any questions, please drop me a comment and I’ll be very glad to answer it! Last month, my friends on facebook told me about the Blog4FT contest, a contest in which you blog about the Federal Territories of Malaysia. 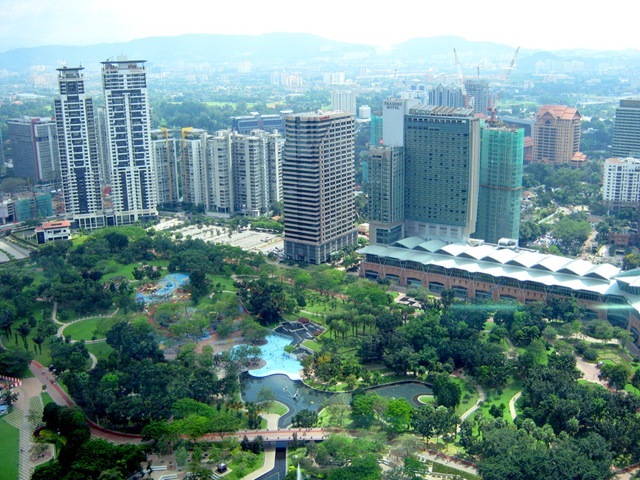 When I was about 6 years old, I had been to many places in Kuala Lumpur. Now I am 11 years old. So, I took advantage of this great opportunity to explore and rediscover Kuala Lumpur, the exciting capital of Malaysia, because I believed there would be deeper things for me to learn, and then, to share. I guessed this is the purpose of the contest too. So, I persuaded my mom to bring me on a tour to the exciting and amazing places in Kuala Lumpur (KL) as it was my school holiday too. After a 2-week journey, I would like to share with you the most remarkable places I’ve visited and the impression and feeling they left in my heart, in this blog post. 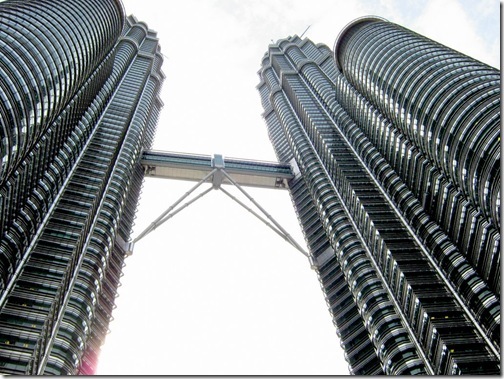 The Petronas Twin Towers are more beautiful than I can describe. 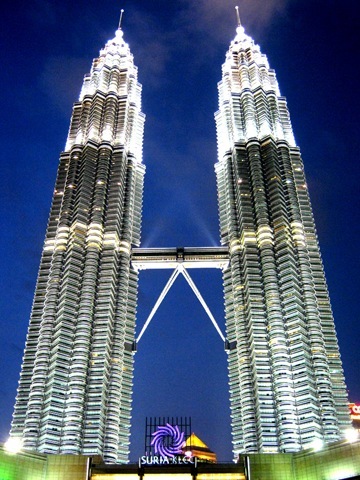 With 88 floors, it is 452 meters high and it was built on the world’s deepest foundations: 375 feet! 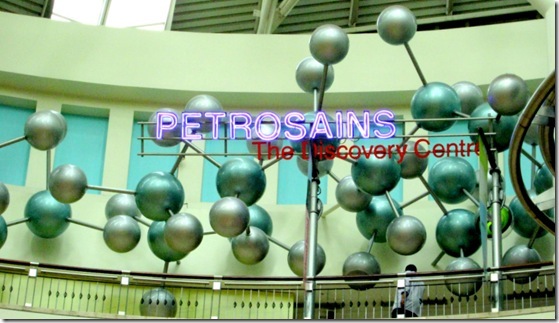 It cost about RM 4.1 billion! It will surely last forever for generations to be inspired by. 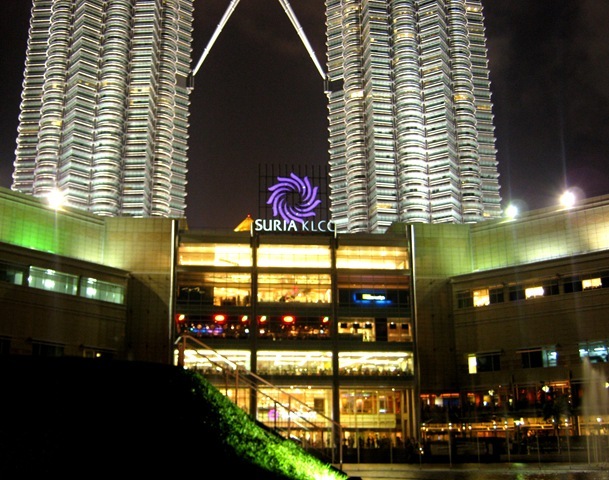 Truly, it is the most majestic building in Malaysia to me. Just look at how high it is! 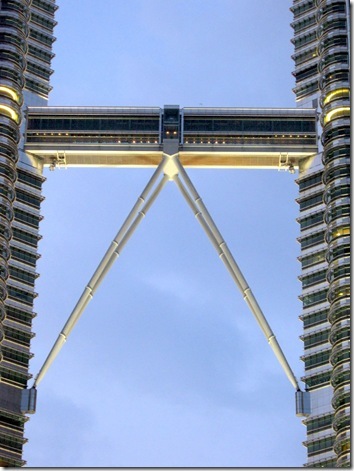 Although it is not the highest building in the whole world, it’s structure is simply marvelous. 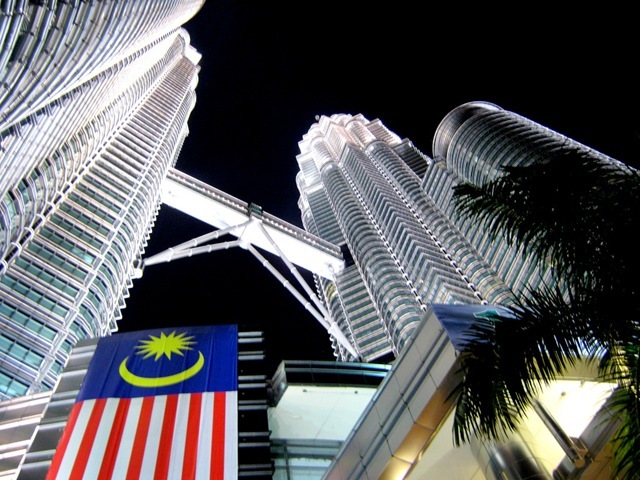 As a patriotic Malaysian, I would like to say that our Petronas Twin Towers is still virtually higher than Burj Dubai, the highest building in the world. So let’s do some maths. 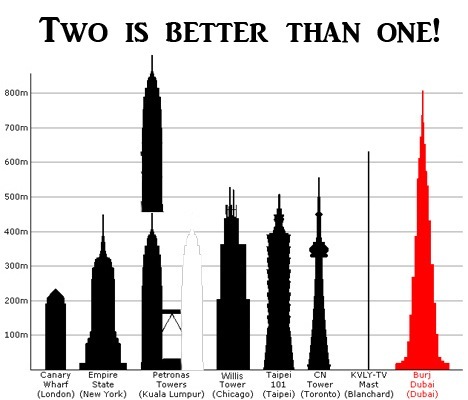 Burj Dubai = 828 metres. So two is better than one! 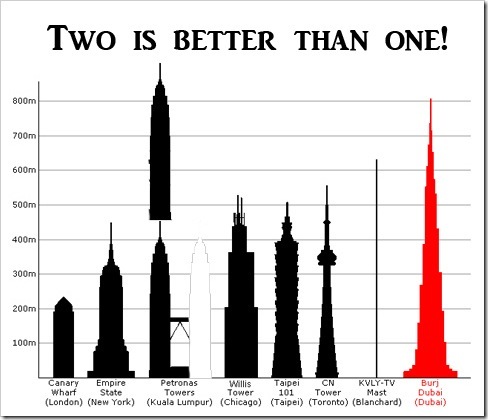 But even though if I don’t use my imagination and use photoshop to stack the twin towers up, it is still the tallest in the world as twin buildings. Oh yeah! 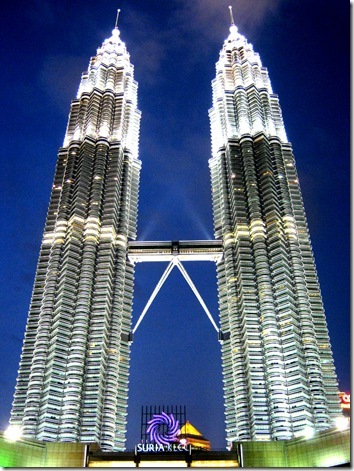 When night comes, the towers light up ever so beautifully, like twinkling stars in the night city sky. It’s really a beautiful sight for everybody to enjoy! 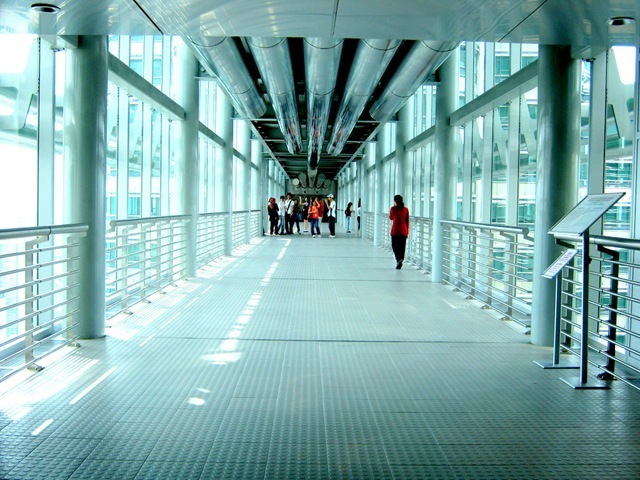 The skybridge is a really thrilling attraction. It was really an exhilarating experience to be up there. It was so breathtaking. The view of Kuala Lumpur was really near-at-hand. 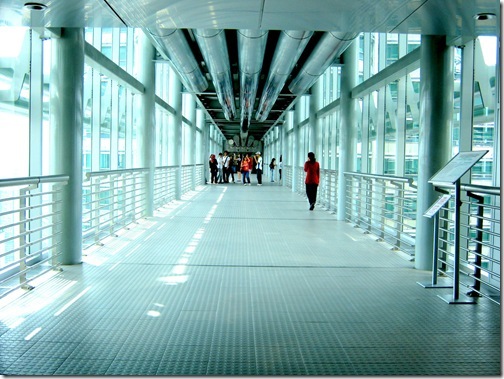 The Skybridge is known as the gateway to the future. A close-at-hand view of the KLCC park and the city from the skybridge. Jumping for joy before the tour guide called us to leave. 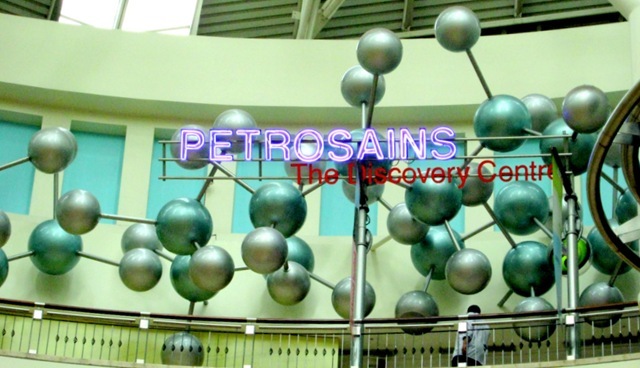 In the Petronas Twin Towers are many other attractions too, such as Petrosains, The Discovery Centre – a really fun science discovery centre for kids, and also adults. 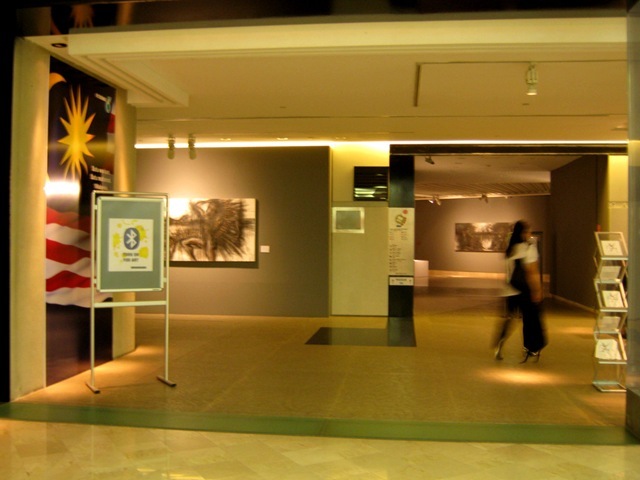 There is also the Petronas Art Gallery, a world-class art gallery. I really enjoyed the artwork of local and international artists and sculptors because the designs were so fine & intricate! 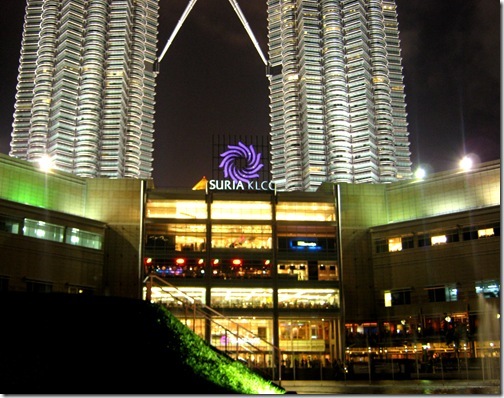 These two attractions are located within Suria KLCC, a mega shopping mall (that has everything under the sun) at the base of the towers. 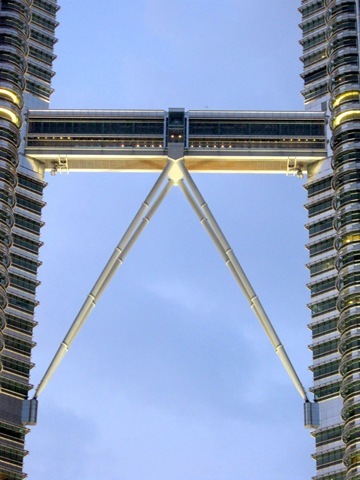 I really enjoyed being at the Petronas Twin Towers because there were so many fun and attractive attractions where I can enjoy and have fun with! Click here to the full story of my fun adventure! Recently, I was interviewed by Sarah Cook on Saturday Morning Mastermind. Sarah Cook is the founder of Raising CEO Kids, a company that is created to help, support, and mentor kids who are in business. She also interviewed my mother about how she raised me to become a gifted child. You can listen and also read the interviews below. P.S. By the way, today, January 3rd 2010, is my 12th Birthday! Yay! Sarah – So where can they find you on the Internet? Sarah – And where else? YouTube, you have a YouTube channel right and twitter? Gloson - Oh. And you also can find me on twitter. My username is Gloson – G-l-o-s-o-n.
Sarah – That’s perfect. So tell us a little bit about your book, the one you’ve already written and published and the one that you’re still working on. Gloson - Oh. 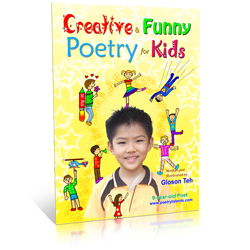 My first book, “Creative and Funny poetry for kids”, has got 20 funny, creative and imaginative poems for kids. It contains 20 funny, creative short poems that are to be sung to the tune of “Row, row, row your boat.” Okay, now I’m going to sing two of the poems. Sarah – That is great. Sarah – So did you make all the artwork in your books? Gloson – Yes, I did. I illustrated my book, both of my books. I draw the illustrations using pencil and then I scanned them into the computer and then I used Photoshop to make all the necessary changes. Sarah – That’s great. That’s great. So you used like colored pencil and marker or just colored pencils? Gloson – Actually I used Photoshop to color everything. Sarah – Got it. Okay. So how did you get published? Was there a publishing company or did you self publish? How did you do that? Gloson – Well, my mother self published it. Sarah – That’s great. You have a nice mom. 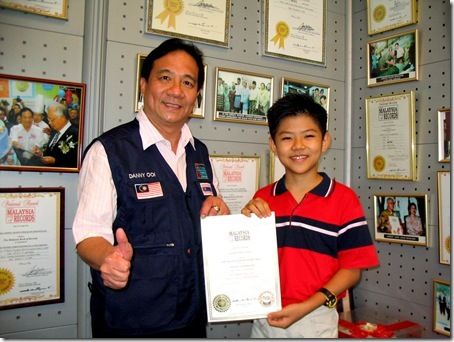 So Gloson, you have been named the youngest poet in Malaysia. How does that feel? Gloson – Well, I feel very honored and very motivated. 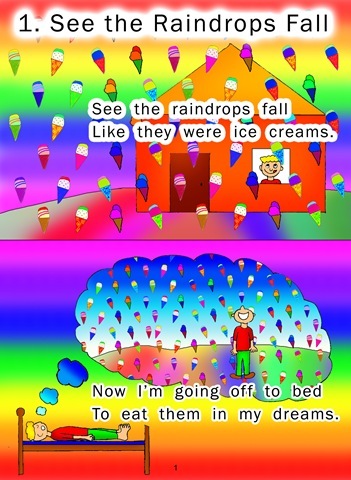 And I also am inspired to write more poems. Sarah – That’s great. So this past July, you and your parents met the Prime Minister and the first lady of Malaysia. Tell us a little bit about that experience, because there was a lot of the press there, the news people were there. Tell us about that. Gloson – Okay. Firstly, my mom sent my first poetry book to the first lady of Malaysia. She is Datin Seri Rosmah Mansor. I think she is very impressed. She also is very kind and then she organized a meeting with me and my mom on July 10 2009. When we arrived at the meeting on that day, we were surprised to see so many reporters from all media in Malaysia and also the Prime Minister of Malaysia Dato’ Seri Najib Tun Razak. And the reporters took photos of me talking with the Prime Minister and the first lady. The Prime Minister also took my poetry book and read my poem all to them. And he said it was very good. They also read my blog as I’m the youngest blogger in Malaysia. I then performed a poem in front of the Prime Minister and the first lady. I feel very honored because I have been given that opportunity. Sarah – Congratulations. So what is – because most of the people listening to this call are either going to be parents or they’re going to be young kids like you that are in business, what is the number one source of income that you’ve found so far and are you exploring other places for income? Gloson – Well, in November I got my most satisfactory income. 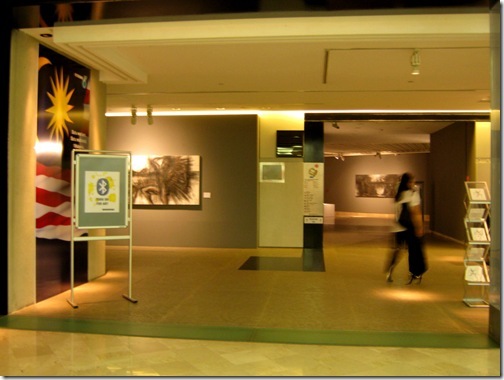 It was the order from the National Library of Malaysia for my first poetry book. Other than that, I haven’t been much involved in selling my book. But next year I would like to do more sales. Sarah – Great. So mostly you’re focusing on your book. Have you done any advertising on your blog at all or anything like that? Sarah – Not so much yet. Okay. Gloson – Yeah, I think next year that it will be more advertisements. Gloson – Because next year all the government is teaching poetry to all seven year old primary one students in Malaysia. Sarah – That’s great. So how did you learn blogging? How did you get started? Gloson – Well, I, my father’s friend helped me to set up my blog. Then, after that I took it from there and then I learned the things all by myself. And then most of my blogging knowledge came from my experience and experimenting. And then I also built up my blog knowledge through reading other blogs especially the blogs that teach blogging. Sarah – What are some of the ones that you like to go to the most? Gloson – Well, I would recommend www.problogger.net. And it is a very popular blog teaching blogging. 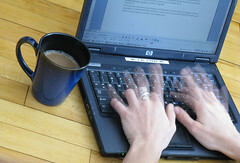 Another one of the first blogs that inspired me is www.dailyblogtips.com. Sarah – Okay, dailyblogtips.com and problogger.net. Great. Anything else? Sarah – Okay perfect. Because your blog looks fabulous. It has so much good information and all the graphics are fabulous so you’ve done a really, really good job. So is there anything else that you would like share with the biz kids listening to help them reach their own dreams? Gloson – Well, my advice, my first advice for biz kids is to find out something that you are good at and that you also like to do that thing. Then, find some ways to make money from that thing you are doing, then you’ll enjoy making money. My second advice is to be patient because success does not happen overnight, it takes time. When my blog was new it has quite a few visitors. Now it has about 150 daily visitors. My last advice is to learn from your mistakes. Everyone makes mistakes, you see. The important thing is whether you learn from the mistakes or not. Besides, the mistakes are good things to blog about so I can teach others how not to make it. Sarah – That’s great. That is so great. So for sure, learn from mistakes and you said be sure to be patient and also follow the dreams and try to turn their pasts in, the things that they really like to do into something that they can make money. And that’s what you’ve done. That’s just so excellent. So you were seven when you did your first poem or how old were you? Sarah – How old were you when you wrote your first poem? Gloson – Oh, I was nine years old. Sarah – Nine years old. But now they’re teaching it to seven year olds? Gloson – No, no, no, I mean seven year olds. Sarah – Oh okay, okay. That’s great. And how many brothers and sisters do you have? Gloson – Well, I have one little brother. Sarah – And he likes to do things like this too, right? He likes to dance and things like that? Gloson - Yes. Actually you can view his dances through my blog. Sarah – Yeah, I saw some of them. My kids and I were watching them. So that’s great. Now anything else that you want to share? What do you feel like your parents have done really well to help you be successful? What have you found, what have been the best things that they have done to help you? Gloson – Well, my mom always gives advice to me and encourages me to become a better person each day. And she also really loves me and gives a lot of advice. Sarah – That’s good. What about your dad? Gloson – Well, my dad supports me in blogging. And because he’s good at computers but he doesn’t own a blog. He helps me with some of the technical aspects like buying domain name and stuff like that. Sarah – That’s great. That is so, so, so great. So is there anything lastly that you want to share before we start talking to your mom? Sarah – Well, Gloson, thank you so much. It has been such inspiration to talk to you today and I can’t wait to see what 2010 brings for you because you have a lot of experience and your blog is going lots of visitors everyday and you should be able to start making money from advertising on it as well as maybe teaching some social media classes or blogging classes. That’s just so phenomenal. Gloson – Yeah. 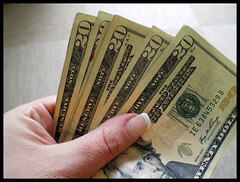 Also in the future I might to like to learn money to earn money through blogging. Sarah – Absolutely, you absolutely should. Well, congratulations on that huge order from the library, that’s just fabulous. Have a great day. We will be posting this really soon on the Saturday Morning Success series and you can find Gloson at his blog as well as on YouTube and Facebook and twitter. And make sure to check him out. He’s a young blogger and a young poet who is doing extremely fabulous job connecting with others around the world. So congratulations Gloson. Sarah – Perfect. Poetrytalents.com. right? That’s great. All right. Well, let’s go ahead and talk to your mom and we’ll see what she has to say about how you have become successful. Sarah – Hello, thank you. Hi, how are you? Grace - Fine, thank you very much. Sarah – I’m so glad that you’re willing to talk to us today. This is a little bit unique. It’s my first time recording on Skype and this information will be shared. We’ve got about 100 people signed up for the calls and so we’re working on growing this company called Raising biz kids (Now Raising CEO Kids) and helping kids around the world to be successful in business but also really, really helping parents to learn how to raise successful kids in business. Because it takes a little bit of work to keep up with them and their interests and their activities and handle the news people and all those things. So I just applaud you and congratulate you for what you and your husband are doing to support Gloson and also your other son. I just think it’s amazing. Sarah – So, what are some ways that you have encouraged Gloson in his writing and his blogging? Grace – Since he was young, I have been always encouraging him to do a lot of reading because I believe when you read a lot the writing skill will come spontaneously. Secondly, also encouraged him to do a lot of thinking, like a thinking bee or a thinking pooh to researching and to analyze so that he can understand better and fast. Thirdly, I encourage him to do research on things that he wants to know, especially through the internet. Sarah – That’s great. So why do you think it’s important to encourage the kids to just explore the things that are important to them rather than telling them to do things that we want them to do? Why do you think it’s so important that you’ve encouraged him in his poetry? Grace – To me to develop the talents of kids is very important because I believe we are all born with so many talents; we can sing, dance, write, count. 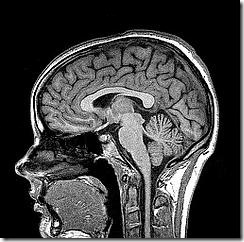 You see, we also know that there is, that was a research done by Dr. Howard Gardner about eight months before intelligence. So I believe we are born with many talents. The thing is we should a very important because I also believe the talents can be disappeared slowly or become more difficult to develop later or become dormant or the children lose interest in whatever they have been good at. And the last point is, they don’t have enough time to do it when they grow up only did they realize it. The last point will bring to another point is why I encourage my sons or the children of the world and the parents to help the children to explore in business. In real life in our school, we were taught all basic knowledge like mathematics, science, languages, geography, history, etc. We are good at a lot of basic knowledge like that but we might not be good at any particular one, firstly. Secondly, we might not truly know who we are, what we are truly love for, we are really good at. Then when we grow up, we will struggle of thinking what are the jobs suitable for ourselves. That is the struggle that I believe we can avoid if we teach the children to explore being in business when they are young. Sarah – That’s great. I love what you said about when they’re older, they have so many responsibilities and so many things that they’re required to do. So when they’re young, it’s a great time to get them interested in business and in their talents because they have a little bit more time. Yes, they’re busy with school and maybe activities but if we can encourage them right now and they’ll develop a lifelong desire to be successful and to explore their talents. So thank you for sharing that. What are some ways that you and your husband have supported your kids? I know Gloson talked a little bit about helping him get his blog started and you sent the book into the Prime Minister and the first lady. And I’m sure you’ve done lots of other things. Can you share with us some things that you’ve done that other parents could learn from? Grace – Something; I mean, any help I have done to my son? Sarah – Yeah, anything that you’ve been helpful? Anything that you’ve… do you read a family poetry? Do you help him learn about blogging? Like what are some things that you’ve done to support Gloson in becoming a better poet? You did talk about some already; reading poetry and thinking, encouraging him to think on his own. Just anything you can share. Sarah – That’s okay, we’ll go onto the next question. So have there been any struggles? Has there been a time in the last year or so that Gloson has or maybe in the last couple of years that – have there been any hard times that you’ve had to help him work through? Grace – Do we help him work through? Sarah – Like has he gotten discouraged? Grace – I believe that he has not much problem in doing all this stuff because his EQ (Emotional Quotient) and IQ (Intelligent Quotient) are very good. Grace – So the only factor that I feel that I am not capable of helping him is his physical needs. He needs to eat so much suitable and nutritious food. Sometimes I felt that I cannot provide all. Sarah – All the support for him. Grace - Other than that, I mean he’s a very good child. He’s EQ, IQ, I mean, very good. Sarah – That’s awesome. It sounds like he’s extremely smart. Grace – Yes. I believe it was because when he was born I really trained him in something like memory skills, creativity thinking, logical thinking, analysis, and reasoning. A lot of stuff which I also now have forgotten about. And I stopped teaching him when he was two years plus because at the time my husband started to face some financial difficulties. And, but I noticed that that two early years of his life, he has been really brain stimulated. And after that he carried on all the learning by himself. He learned everything by himself, I never sent him to any classes. But I noticed that he can do whatever he put his hand into. For example, he can learn a lot of things on the spot. He can write poems spontaneously, everything. Even he learned to speak good English when he was five years old when I moved to a place that the children are speaking English. When he was young, we were talking in Mandarin. 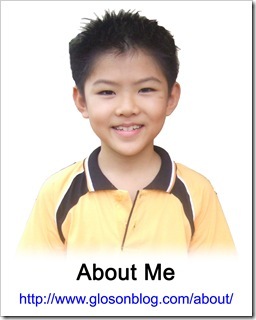 Soon we had moved to a new place and he was five, he couldn’t communicate with children in English. But then from that time suddenly he wanted to make friends with them; he started to pick up English and he picked up so fast. And he writes good English. Yeah, I really admire his diligence and dedication for learning. Sarah – Well congratulations to all of your efforts with helping him to be successful. That is just amazing. So is there anything as we finish up, is there anything that you would like to share with kids listening as well as with parents that will be listening? Firstly always desire and open your heart for learning. Listen to advice from good friends and good parents. Secondly, try to understand yourself and also the facts and reality of life. Thirdly, learn to discern what and who are really helpful to you. That’s my points to the kids. And to parents, I would like to say that try to understand your children’s true passion, talents and focus on it. And do not think that; don’t have prejudice over which job is better than the other one. For example, perhaps people commonly think that being a doctor is better than being a singer or vice versa. So do not think which job is the best for your children because the children must enjoy their true talents, abilities and their passions for that job. Secondly, I would like to encourage parents that they must spend time to show love, to show concern to their children. Any 10 minutes heart-to-heart talk at least a day and those who are full time mothers they can do more to show their concern to build up their emotional quotient (EQ). 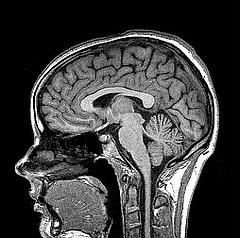 To me, emotional quotient for children is far more important than IQ development. Thirdly, I believe they must also mentor their children step by step according to how much work the child can take now. And secondly, how much hard facts the child can face now so that the parent can administer, council the facts of life to the children as early as possible. To me, to teach children to exploring business is very important. To me, it’s almost the most important thing in life because you see when we wake up in the morning, the toothbrush and the toothpaste we use, and until we retire to bed, the bed we sleep on is all about money; we need to purchase it. So we monitor their mental maturity and tell them the real life is all about money, I believe is important. Of course this must be done after we have told them what invaluable things are like love, kindness and responsibility – these are more important than money. After we have done all this, we must have to teach them the hard facts of life is all about money. 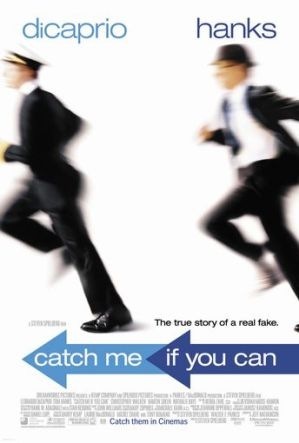 This is a real life story which was made into movie. The real person was, (I think he is still living) Frank Abagnale Jr. He started to cheat the bank when he was 16. And then after when he was about 30+, he repented from all his mistakes and he said a word that really touched my heart. He said, “How good if you can be, we can have 20 year old body with a 40 year old brain.” I believe what he meant is if we can be mature as young as be so that we will find happiness in our life earlier and do not have to go through unnecessary mistakes. Sarah – Right. Right. That’s excellent. I know we saw part of that movie and I think it’s important what you say that we need to learn early to be responsible and kind and gracious and loving and faithful and true and also learn about money and about business. Because then when they’re making money, when the kids are making money then they will know how to manage their money; they’ll know how to handle it. So that’s excellent. Thank you for sharing all those things. So thank you both for your time Gloson and Mrs. Teh, thank you for your time. I so appreciate you staying up. I know that it’s like two o’clock in the morning, right? Grace – Oh it’s all right. It was our pleasure to be invited. Sarah – Well, thank you, thank you, thank you. And you both have a fabulous day. Grace – Thank you very much. Grace - Bye everybody. Bye Sarah. Thank you. Sarah – Thank you so much. Bye, bye. I hope you enjoyed the interviews and have benefited from it! Please check out Sarah Cook’s Raizing CEO Kids. Also, don’t forget to sign up at Saturday Morning Mastermind in order to hear more interviews like these! Just fill in your name and your email! You can also follow Sarah Cook on twitter – @MomToBizKids. Thank you once again, Sarah Cook, for giving me the opportunity to be interviewed on Saturday Morning Mastermind, It is like a birthday present to me. Looking forward to your comments to! I will also regard them as your birthday gifts for me.